Safari only had one eye. The story goes that she lost it during a vicious fight with Mafufanyane, the territorial male of the area. The irony is that they were lovers once. They even had cubs together. Both were legends of the northern Sabi Sand area in their heyday. Mafufanyane was a beautiful proud male and a pleasure to photograph. He was grumpy and constantly growled at the game-drive vehicles. He also had a habit of following the females of the area and taking their food from them in a dramatic show of dominance. This led to spectacular interactions and stunning images. He was any photographer’s dream. Safari, on the other hand, didn’t make it into the category of leopard supermodel. Her big shiny eyeball that bulged from her skull didn’t “do it” for wildlife photographers, me included. When rangers reported a leopard sighting over the radio, I always asked first whether it was Safari. If it was, I would then suggest that we should rather go and photograph impala, but normally (always!) I was outvoted by the non-photographers on the vehicle and ended up following Safari for many frustrating hours without getting any images. Call me a purist, but I would much rather photograph any other flawless animal than take a prizewinning image ruined for me by a protruding blind eye. The resulting nightmares would be too much to bear. And the nightmare almost came true. We were following her one evening while she was hunting. Suddenly a few impala walked right up to her. They took fright, but ran straight towards her. She leapt and caught one of them in mid-air. I got the photograph, but unfortunately my flash didn’t go off. Everything was perfect – the leopard was in mid-air upside down, I had the right lens on my camera body (70-200mm), the focus was perfect and I released the shutter at exactly the right time. It was just the flash that didn’t fire. To make matters worse, I now have an image where the leopard and impala are visible despite the flash not firing, showing what might have been. Safari did, however, make it up to me. After this unfortunate missed image, I did continue to photograph her selectively – mostly when I couldn’t bear the thought of not photographing her anymore. One cannot follow a leopard for hours and not photograph it, even if you know you will never be able to use the image because of the missing eye. I always waited for her to turn her head and photographed her from the left-hand side. Another way was to hide her eye by purposely concentrating on taking blurry photographs, where the detail of the eye was obscured in the blur. I ended up trying all kinds of new techniques with the only aim of hiding that hideous eye. One afternoon after sunset we were following her again with a spotlight. I urged the ranger to keep to her left-hand side so that I could just for once take a photograph without that ghastly eye. I closed down the aperture to f8 and with the 1/5 second shutter speed, the blur was perfect. It almost worked, but unfortunately her head moved up and down as she walked and the blur was too much. But then she yawned, her head moved in a straight line, the blur disappeared and the image came together. 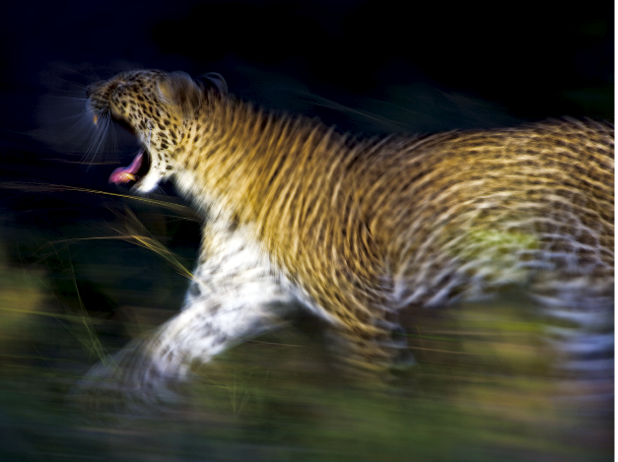 This image won me an award and changed my opinion of Safari – she probably wasn’t so unphotogenic. If it hadn’t been for her eye, I would never have tried to photograph her in this way. So when I heard a few years later that she had passed away, a lonely tear formed in the corner of my right eye.